Do you have a silver fish infestation?. Silverfish are fairly harmless, but these grayish-blue, serpentine creatures aren’t pleasant to have around the house. They feed on books, dead skin cells, and other starchy materials and thrive in dark, wet spaces. Once you’ve determined you have an infestation, you can get rid of silverfish by trapping them, repelling them, killing them with insecticides, or making your home less hospitable. Silverfish are known for their destructive feeding habits. 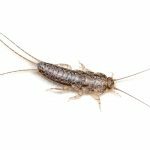 If you find any silverfish inside your home, a exterior application with a residual insecticide around your home on a monthly program will eliminate your silverfish problem. Bugsy's will come out periodically to monitor your home and help prevent an infestation of SILVER FISH.